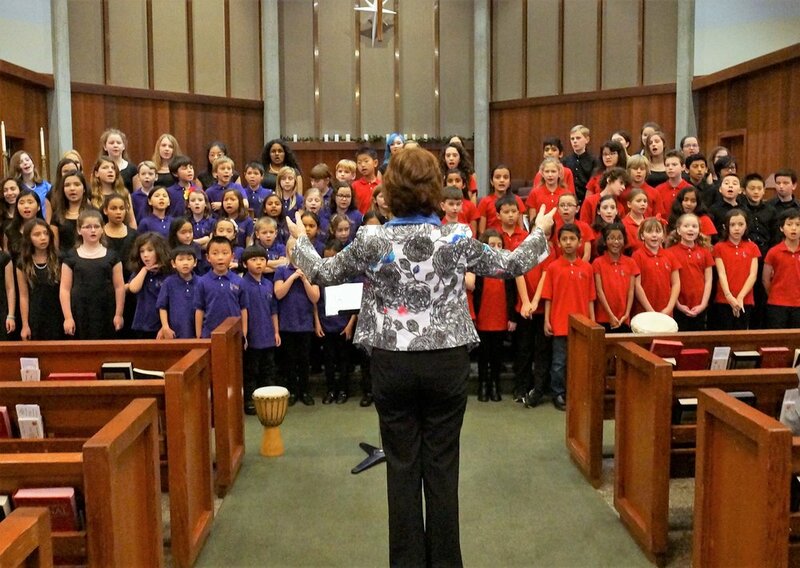 Vivace Youth Chorus of San José welcomes both beginning and advanced singers. We offer developmentally appropriate instruction for youth from 4 to 18 years. All singers wishing to join a chorus above the Rising Notes level need an individual assessment with our artistic director. No preparation is needed for this relaxed and friendly session; however, singers interested in auditioning for the Teen Ensembles are encouraged to bring a prepared song. Please contact the office to make an appointment. To gain the full benefit of participating in our sequential learning experience, choristers are encouraged to commit to an entire year (September–June). Singers may also join in January at the start of the second semester or at the discretion of the artistic director. Scholarships and family discounts exist to keep the program accessible to families of all means. We look forward to having you join our Vivace Youth Chorus community. *Ages are approximate. Choir assignments are based on ability. Rising Notes is a music class using the Kodály approach and is designed for children ages 4-5. Children are introduced to the joys of singing and musical concepts through folk music and musical games. The class is 45 minutes long and meets each semester. Class limit is 10 students. Rising Notes is our only non-performing group. No uniform is required. While parent volunteer time is not required, we do encourage parents to observe the class and be present. Basics of good singing, a Kodály-based theory program, and repertoire for performances make up the syllabus for this class. 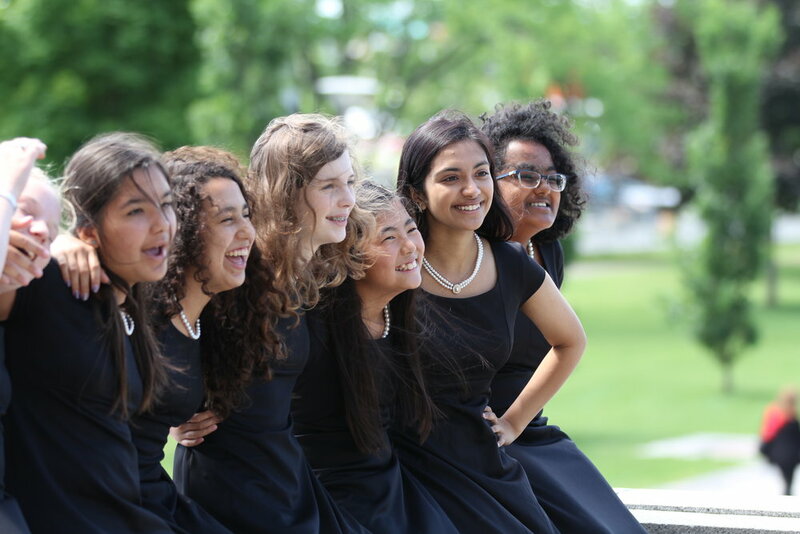 Preparatory singers enjoy building physical awareness of musical concepts along with the foundations of singing technique. During active and playful rehearsals, children internalize the rhythms of music and learn to develop musical memory. Singers are introduced to musical concepts of loud, soft, fast, slow, pitch recognition, using solfege, and rhythm. They focus chiefly on unison music but will be introduced to the concept of two-part singing through beginning canons. Rehearsals are one hour per week, and classes remain small for individual attention. The Preparatory Choir performs in each of the two formal semester concerts given by Vivace. They also participate in performances for community groups such as retirement homes. Intermediate singers enjoy their engaging and dynamic rehearsals. They perform a wide range of musical styles encompassing a variety of languages. They learn through ear training, solfege, sight-reading, and develop their understanding of the necessity of breath support, jaw release, and posture for quality singing. Rehearsals continue to include games and movement activities to reinforce concepts and skills. While working on increasingly difficult canons and other two part music, they learn to read a choral score. Emphasis is put on being a member of an ensemble and supporting other singers in the choir. Students rehearse 1 ¼ hours per week. Beyond regular weekly rehearsals, intermediate choir has one workshop each semester. This allows them a chance to work with guest clinicians. In addition to two formal concerts each year, they perform for community groups and local events. They participate in local choral festivals as the opportunity arises. Concert Choir singers take pride in working toward accomplished performances of increasingly sophisticated repertoire. Their music is in two and three parts, covering a larger range of styles and languages. Students rehearse 1 ½ hours weekly. Concert Choir members attend an annual retreat in the fall to work with clinicians and build friendships that create an excellent ensemble experience. In addition, this group has a Saturday workshop each semester. Past clinicians have included distinguished choral conductors, drama coaches, and Tai Chi and Alexander Technique teachers. In addition to the two formal concerts each year, this choir has various community performances, and collaborations with local musical ensembles. They will also travel outside San José every other year to attend a choral festival. Chamber Ensemble is a select group of advanced Concert Choir students. Chamber Ensemble performs with the Concert Choir, as well as learning and performing additional repertoire. Members of Chamber Ensemble are eligible to audition for solos in concert pieces, serve as choir officers, and as section leaders. Rehearsals are 1 ½ hours weekly. This group has one extra rehearsal per month, as well as the fall retreat and Saturday workshop (for additional information, see Concert Choir). They are also given individual vocal coaching sessions each semester. Members of the Teen Ensemble enjoy working together in a more intimate chamber music setting with sophisticated music especially suited to young women’s or young men's voices. Singers at this level are given frequent opportunities for solos and duets within the ensemble repertoire. These are the only choir levels which prepare enough music each semester for singers to carry a concert of their own. Commitment to practicing independently is therefore essential. The Teen Choirs rehearse 2 hours weekly. They will be further supported through additional sectionals, workshops, and a once a year weekend long retreat. Members of the Teen Ensembles may join Concert and Chamber singers on tours, when appropriate.